1. Your customer data is not good enough. I haven’t even seen it and I agree that your customer information is not perfect. It never is. You have implemented a whiz bang CRM system but getting staff: sales and others, to keep it updated is tough. You probably do not capture all of the transactional touch points that you want. There will be some critical data in another system to which you just don’t seem to be able to get access. Things are not perfect, but relax and start with the data that you do have. When you implement transactional NPS, you don’t have to do it perfectly on day one. Start with the information that you do have. Pull in the customer segments that are easy to get to. Survey touch points that are easy to track. In short, get started with what you have. I can guarantee that you will reap initial benefits while you continue to work on extending the data that you can access. Your staff is probably thinking, or even saying, “It’s another management fad. If we stall long enough, it will just go away”. They will also be concerned that comments about their work will be collected and analyzed. Staff fear and stalling tactics can make you doubt if you should go ahead. Ensure that it is not another management fad. Implementing a transactional customer feedback process is not another 6-month project to be completed and then move on. It is a long term way to improve the competitiveness and profitability of your business. Ensure that you put in the right corporate governance processes for your business and bring everyone along with you. To put it simply, get everyone involved in the process as soon as possible. Also, the fear that an unhappy customer may make personal or degrading comments about a front line customer service representative is real. The truth is, these comments occur very rarely, much more rarely that you might think. However, the only way to overcome this fear is to be completely transparent with you staff. First, give them access to their specific feedback, before you give it to others in the organisation. Use the customer commentary for supportive coaching. Then as staff sees the value and the lack of personal or degrading feedback, they will quickly accept the approach. 3. What do you tell your customers? Don’t let your fear override your desire. You will find that if you are open and transparent with your customers, they will be surprisingly supportive. There will be the doubters and naysayers but if you are transparent, you will find “engagement” (and loyalty) from the majority of your customers will increase. Your customers don’t want to see you fail. Ensure that you reward the effort that they invest in providing you feedback by closing the feedback loop. Tell them what you heard and what you’re doing about it. You don’t always have to do what they ask, and they will respect your decisions if you tell them you heard what they asked for, but can’t provide it and why. You may find that one area of your company has caught the transactional NPS bug and are pushing hard but other areas just don’t seem to care. Cross functional collaboration is very important in extracting the most value from this approach and a varying level of take up can seriously dent your long term results. Setting up a solid governance process for your customer feedback process on day one is critical. Your governance process should include a steering committee, process action team, and a process to link those teams back to the different parts of the company. Your Net Promoter analyst may be able to tell you what is driving customer dissatisfaction, but only the operational staff will be able to tell you how to correct the issue. You must focus on a creating an environment where people in all areas of the organisation can contribute to improvements. You will likely find a couple of issues when trying to driving change: turning data into root causes and turning root causes into action. 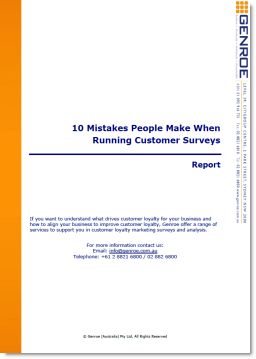 It is common for feedback from customers to be ambiguous and difficult to interpret. One of our customers identified that a particular function in their software application drives lots of positive and negative feedback. “Promoters” loved the feature but “Detractors” said it didn’t work and was confusing. What they discovered, after some analysis, was that it was not the feature that was the issue: it was the training that the customers had received. Customers with the right training loved the feature. Customers who did not have training hated it. Now, with the root cause identified (training), it then becomes a question of how to improve the cause, or turn the root cause into action. In this client’s case, there was not a simple solution to the cause. Be aware that some customer issues will be more difficult to solve than others. If you start with that understanding, you will not be discouraged when the root cause is difficult to uncover. Understand that just because the root cause may be difficult to uncover does not mean that it does not need to be resolved. You want to set feedback score goals and targets but are not sure how to set them for the best outcomes. This is a legitimate concern. Set incorrectly goals can drive unwanted behavior from you staff.